Secret Santa at The Bombay Store! An extravaganza of sights, sounds, gifts & happiness – Christmas celebrations are ushering in. Among this merriment & cheer, we at The Bombay Store have planned something very special for you. 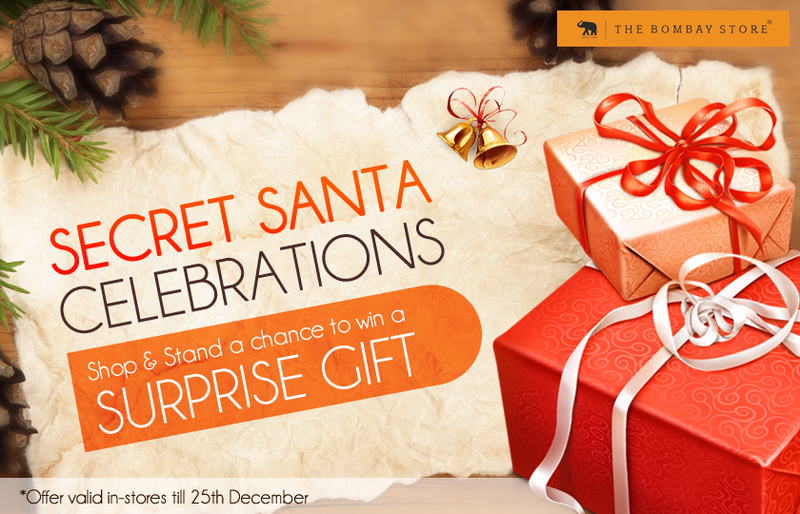 Starting from 17th December ‘Secret Santa’ celebrations have begun at The Bombay Store. To be a part of this Christmas extravaganza, all you have to do is shop at any of The Bombay Store outlets between 17th to 25th December and stand a chance to be among the lucky draw winners to win prizes. One winner will be declared everyday from all our stores across Mumbai, Pune & Bangalore basis a lucky draw and the winner announcement will be done on our Facebook & Twitter profiles. We are sure it must be a very delightful feeling to have a surprise gift delivered at the doorstep for Christmas, isn’t it? So don’t forget to make The Bombay Store a part of your shopping list for Christmas to stand a chance to win this surprise gift. The Bombay Store turns 109 Years Old! The Bombay Store– One of the most preferred lifestyle stores is celebrating its 109th anniversary today on 17th December, 2014. What came into existence as Bombay Swadeshi Co-Op Stores Ltd in 1905, was rechristened in 1995 as The Bombay Store. The Bombay Store is now one of the leading lifestyle stores providing products with a traditional yet contemporary touch. With 9 stores across 3 cities & an online store, we cater to audiences from different parts of the country. On this special day, we would like to thank our customers, team members, our partners and everyone else who have been associated with us and helped us grow in their own way. Two distinctive brands are showcasing their collection at The Bombay Store’s flagship store in Fort, Mumbai between 15th to 31st December. Witness a unique collection of Premium Doodle Diaries that are a combination of functionality & design. There is a perfect diary for everyone. Tiara is a house of Home Décor, Wedding & Gifting Solutions. An endeavor to bring some of the most beautiful collection for you. So come visit us & indulge in these breathtaking celebrations from 17th to 31st December. We will be delighted to share our happiness with you. Cheers to these outstanding 109 years and many more to come! Three Days of Great Discounts! The Great Online Shopping Festival has begun & so has the season of sales. Brace yourselves to digest an overload of happiness as The Bombay Store is a part of #GOSF this year too. 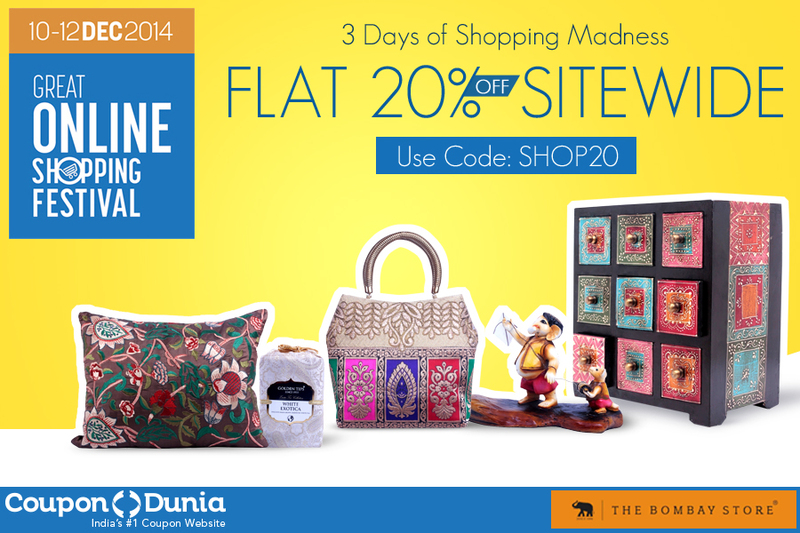 Join in the shopping frenzy with a Flat 20% off at The Bombay Store for 3 days starting from today upto 12th December. To avail the discount, all you have to do is visit www.thebombaystore.com, shop your favourites & enter the code: SHOP20 on checkout. No minimum shopping value, No Terms & Conditions. It’s a Flat 20% off.